I’m beyond excited right now! Mi mama and I just returned from our evening walk to the park and discovered the mailman had delivered a package addressed specifically to me. At first, I was very confused as I didn’t recall ordering anything from the Home Shopping Network in the past couple weeks and my birthday is still more than a month away. What in the world could it possibly be? 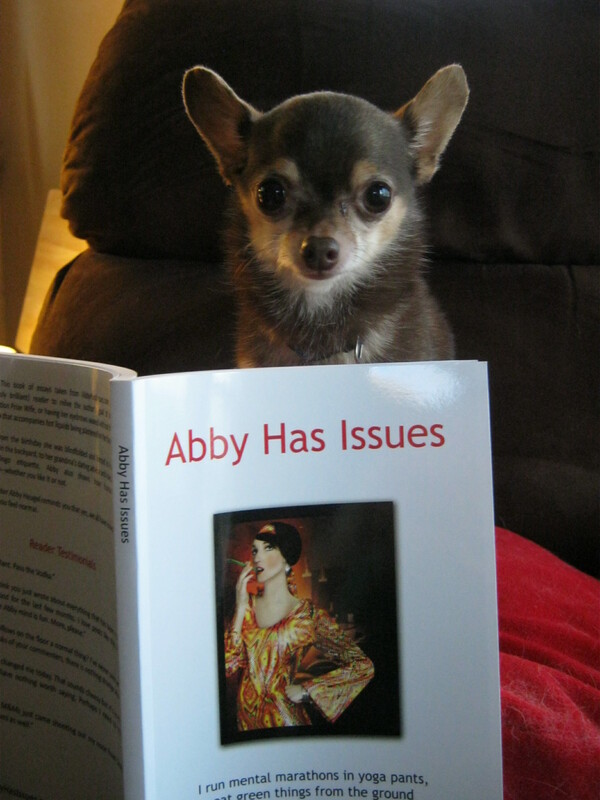 And then I saw who it was from and instantly knew what was inside that lovely yellow envelope– Abby Has Issues by Abby Heugel! Signed by the awesome diva-licious Abby herself, along with a lovely little note for your’s truly. Apparently I had entered giveaway on Abby’s blog for leaving a comment on one of her posts, and mine was randomly chosen to receive a copy of her book. I’d been wanting to read her book ever since I came across her blog, but mi mama recently put the kibosh on my online shopping after I “accidentally” ordered a 10-year’s supply of baby carrots and a life-size Shakira doll, without her permission. So I am muy ecstatico to have won a copy of her book! Yay, thanks Abby! Totally unrelated, but here’s a recipe for your viewing and chewing pleasure. I made it on a whim last night for mi mama and papa when I had very little time and a fresh package of tempeh to use. Feel free to substitute chicken or tofu in place of the tempeh. The marinade rocks no matter what you use to soak it up with. 1) Combine all ingredients, except tempeh, in a zip-loc bag. 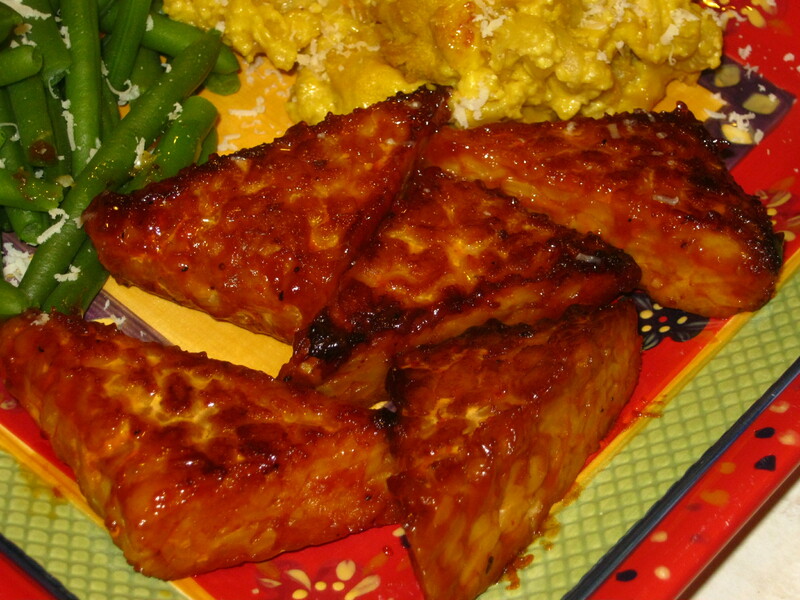 2) Cut tempeh into 8 equal triangles. Place in bag and shake to coat evenly. Allow to marinate in the refrigerator for at least 30 minutes. 3) Heat canola oil in a large skillet over medium-high. Add tempeh and cook on each side 5-7 minutes, or until crisp and browned. 4) Serve on a bed of rice or salad greens or whatever you want to eat it with. I served mine with some leftover Butternut Macaroni and Cheese and lightly steamed green beans. Mmmmmmm! *Use 1 or 2 chicken breasts chopped into bite-size cubes, or pressed tofu cut into triangles or cubes, if you wish. Alright amigos, I have to be going now. I’ve got an awesome book I want to go dive into! I NEED you to send me a copy of that picture. I’m not kidding. I NEED that picture. Love. P.S. Don’t forget the picture..